Okinawa's Ocean Expo Park recently held a grand opening for its newest addition, the Okinawa Churaumi Aquarium, on November 1. The new aquarium is currently the second largest in the world and the largest in Japan, and is by far one of Okinawa's greatest achievements. From the first glimpse of the grand new structure housing the aquarium, I was filled with awe at the size of the complex. However, as soon as I entered the building, I was continually surprised at each area of the aquarium. If you haven't yet taken the plunge, I recommend going as soon as you get a chance. Don't miss this! It is certainly a must see for locals, foreigners, tourists, everybody! The name of the new aquarium is Churaumi, chura meaning beautiful in the Okinawan dialect and umi meaning ocean. Inside, dozens of tanks ranging in size from small to gigantic house thousands of fish and sea life from every depth of the ocean surrounding Okinawa in Kuroshio, the black current, which Okinawa sits atop. Kuroshio is one of the two largest currents in the world stretching from the Phillippines, north between Taiwan an Yonaguni Island, continuing north past Kyushu and Shikoku in mainland Japan before heading east near the Boso peninsula close to Tokyo. Once you enter Churaumi, the tour starts on the fourth floor and works its way down toward the first floor. The fourth floor is known as the "Invitation to the Great Sea." On this floor, visitors are given a top view into a coral sea tank where Churaumi staff are trying to grow coral domestically. "This is the first in the world with an open roof to let the sun in," says Tsuyoshi Miyaguni, a Public Relations employee of the facility and our private guide for the afternoon. It was windy during our visit, so the surface of the coral sea tank was choppy, but down on the third floor we had a chance to look into this tank through a glass wall. Aquarium staff are hoping to breed coral and return it to the ocean. The fourth floor also has a surface-watching tour. If you want to attend the tour, you must submit an application at the information counter on the first (bottom) floor in the Whale Shark and Manta Ray exhibit. The first exhibit on the third floor is called "Life in Inoo." Inoo is the specific oceanic area surrounding Okinawa. This is more or less an underwater petting zoo with starfish, sea urchins, shells, and other safe sea life found around Okinawa's coral reef in semi-shallow water. Next, to "Life in Inoo" is a tropical fish tank showing fish found in the deeper waters past the shallow depths of the coral reef including Napoleon fish, large grouper, and others. "Journey in the Coral Reefs" holds some of the smaller, more delicate fish found around the coral reefs. "If they were mixed with some of the larger tropical fish, they would not survive," Miyaguni explained. The last exhibit on the floor is the Churaumi Theater, a high-vision theater which shows educational films giving you the feeling that you are in the ocean. The theater can fit up to 120 people, and each film is about 18 minutes long. 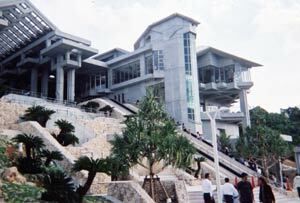 The main feature of the Okinawa Churaumi Aquarium, known as "The Journey to the Kuroshio Current", takes up most of the second and first floors. Here sits the worlds second largest aquarium, the largest in all of Japan, in all of its grandeur and glory. Though only the second largest in the world, this aquarium has two groundbreaking accomplishments which have never been achieved before now. For the first time in the world, this tank holds more than one whale shark. In fact, this tank holds three! 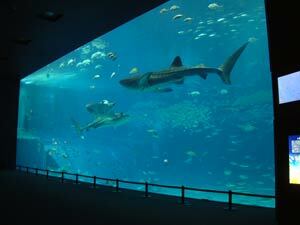 The aquarium holds about 7,500 tons of water and is 10 meters deep! About 130 tons of glass was used to form this tank. Each wall is 60cm thick, 22.5 meters wide, and 8.2 meters high. It is the first tank with an adequate depth for the public to watch the true feeding habits of the giant whale sharks. Unknown to most people, whale sharks feed in a perpendicular position. Also, as the tank holds three whale sharks, aquarium staff are hoping to breed the giant fish. Aside from the whale sharks, this is also the first time in history that four manta rays have ever been held in one tank. It was truly awesome to watch the giant whale sharks loafing around the surface while the manta rays glided between schools of large tuna that ended up looking like mere minnows in comparison to the size of the manta. Simply amazing! After being dumb-struck by the size of the worlds second largest tank, we continued to the "Shark Expert's Room" where I found myself standing in front of a tank holding the worlds most dangerous sharks. Inside were numerous great whites, hammerheads, and other predatory sharks. 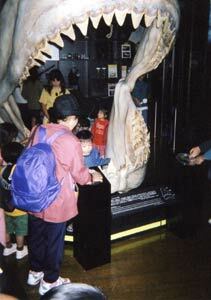 The room also has a life-size remake of a megalodon's jaw, an ancient ancestor of the great white shark. The jaw is very, very big--taller than most humans--and is a favorite photo spot for aquarium visitors. Other exhibits in this room include an area for feeling shark skin as well as multiple shark jaws hung on a wall. Next, we entered the "Aqua Room", a tunnel where you can look up through the ceiling and through the side walls into the main tank again. Here you can see the true size of some of the oceans giant sea life as they swim above and beside you. Also on the third floor is the Café Ocean Blue, a small café where you can sit at a table right next to the gigantic aquarium. It must be quite a rush to eat a meal here! I didn't get a chance to do this, so I'll have to return again as soon as possible to see what it feels like to eat a sandwich next to a whale shark. I don't think there are many places in the world where this is possible! Finally, we entered the first floor of the complex, known as the "Trip to the Ocean Depth." Here were various tanks holding large crabs and strange fish found at some of the deepest depths of the ocean. "It's very difficult to catch these," Miyaguni commented. "They live at depths which divers can't withstand for long periods of time." I had never seen some of these fish before even though they were found around Okinawa. So many fish and other sea life exists at these depths that have never been seen by the public eye. This area is certainly full of wonder! Also on this room is a whale shark and manta ray exhibit that serves as a waiting room for those who apply to go on the surface watching tour and a gift shop where you can buy stuffed whale shark toys, t-shirts, Okinawan cultural items, postcards, and much more. After leaving the gift shop, our tour had finally come to an end. Five minutes later, I was ready to go through the whole thing again, but, sadly, this was not a possibility. The aquarium complex first opened its doors to visitors on the first of November. Since then, it has been flooded with visitors! I paid a visit on the third day it was open. According to Miyaguni, more than 7,000 people came on opening day, 11,200 came the next day, and during my visit they already had more visitors than the previous day by 1 p.m.! I asked what the overall staff response has been to the crowd turnout and he said, "We were shocked!" Expo will surely be a pretty big tourist spot for a while. Driving to Ocean Expo Park is very easy. Head north on highway 58 past Nago City and continue north. You'll see road signs everywhere for Ocean Expo Park. Follow them and they’ll lead you right to the park. Thousands of people have been going to the new aquarium everyday so parking is sparse. I recommend parking at the south gate. When I visited, far less visitors were parked here and we were able to find a decent spot right away. All of the other parking places were full and we drove around at least thirty minutes looking for a place to leave our car. Even paid parking was full. From the south gate, the aquarium is about a 2km walk. It's long, but it beats driving around in circles for an hour to find a parking spot. Also, the line to the new aquarium was about an hour long when I visited, so expect a long wait. Go as early as you possibly can and beat the crowd. You'll find the aquarium far more enjoyable and will have more space and freedom to wander the exhibits. Admission is ¥1,800 for adults, ¥1,200 for high school students, and ¥600 for elementary and middle school students, but group discounts are available. A one-year passport sells for ¥3,600 for adults, ¥2,400 for high school students, and ¥1,200 for elementary students. The complex is open from 9:30 a.m. to 5:30 p.m. but ticket sales end at 4:30 p.m. For more info, call 098-048-3748 or check out their website at www.kaiyouhaku.com.